The new Nokian WR SUV 4 winter tyre is a safe and reliable choice for sport utility vehicles and crossover models. Designed for Central European roads, the tyre’s most important characteristics are excellent handling on slushy roads and solid performance in suddenly changing weather conditions. The new Nokian WR SUV 4 is specially developed for Central European SUV drivers ensuring the best performance on snow, slush and in heavy rain. 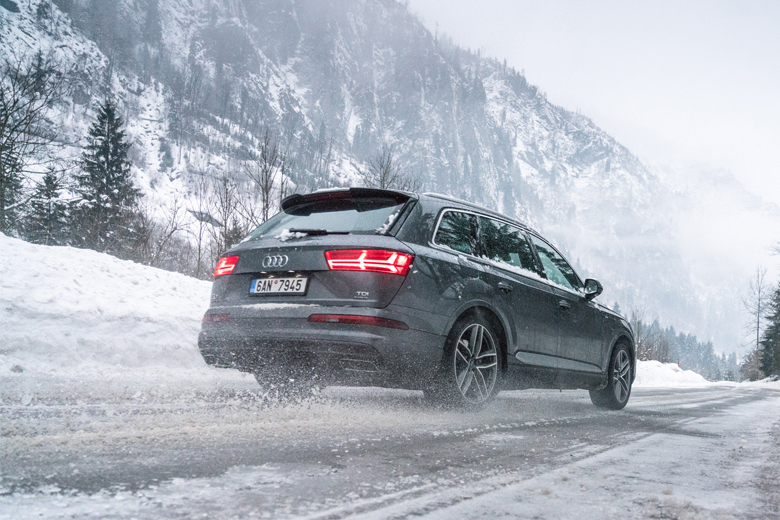 Whether you drive on speedy autobahns, busy urban traffic or scenic Alpine roads, the driving feel is controlled and predictable on slippery and bare roads alike. Nokian Tyres’ Climate Grip Concept masters the sudden changes in driving conditions and guides you and your family safely through winter. Nokian WR SUV 4 offers superb wet grip and precise handling during heavy rainfalls and on mud-strewn roads. The robust and durable structure combined with specially reinforced sidewalls ensure that the tyre is stable and can withstand all the impacts and cuts that may occur while driving. The new tyre is offered in speed categories H (210 km/h), V (240 km/h) and W (270 km/h), and its comprehensive selection covers 57 products from 16 to 21 inches. The new Nokian WR SUV 4 will be available to consumers in autumn 2018. Today the extreme changes in winter weather are well known all over Europe. Heavy rain is becoming more frequent which increases the amount of the ever-dangerous slush, while driving on dry roads is also common. The Nokian WR SUV 4 provides exceptional combination of snow performance, handling properties on wet and dry as well as aquaplaning resistance. - The overall volume of rainfall is expected to grow and heavy rainstorms are expected to be more frequent due to climate change. It will cause treacherous road conditions and increase the risk of flooding. Adding to the chances of aquaplaning, the snow on the roads can be quite watery and slushy as roads are heavily salted. When handling a heavy SUV especially in high speeds, it is necessary that the tyres are suited for all these conditions. The versatile winter characteristics, excellent handling and an SUV specific construction makes the Nokian WR SUV 4 optimal for Central European winter, explains Marko Rantonen, Development Manager for Nokian Tyres. Aimed to diminish the element of surprise, the winter properties of Nokian WR SUV 4 are based on the new Climate Grip Concept. Consisting of a unique siping system, winter rubber compound and a directional tread pattern, this innovation masters all forms of winter effortlessly and effectively. The directional tread pattern with computer-optimised sipes work optimally in varying winter weather. The tread pattern is designed for high-performance SUVs, ensuring a stable driving feel. The continuous center rib stabilises the tyre on all surfaces, especially at high speeds. A comprehensive and dense network of sipes at the edges of the tyre increases stability and improves handling. The sharp zigzag-like edges open and close during braking and acceleration improving wet grip. The sipes also remove water out of the road surface adding stability and grip on slushy and wet roads. The deep but supported sipes in the center of the tyre’s shoulder areas stiffen the tread blocks, which results in precise and responsive steering. The step support between shoulder blocks and center area with Snow Claws provide maximum grip on snow and stability in high speeds. The snow claws effectively grip their surface when driving in soft snow and on other soft terrain types. As well as adding to snow grip, this design improves the driving feel required for cornering and lane changes. The polished main grooves give the tyre a stylish appearance but also serve a function. They effectively remove water and slush from the surface of the tyre while also giving the tyre a modern look. The Nokian WR SUV 4 offers excellent traction on snowy roads even when the temperatures drop. The Nokian WR SUV Winter compound stays flexible and grippy even in very cold weather. This new-generation rubber compound, developed for varying winter conditions and high speeds, provides also excellent wet grip and wear resistance at all temperatures. Wet grip is optimised by the high silica content of the tread compound. It responds reliably to the rise and drop of temperature. This new compound together with the tread pattern also provides lower rolling resistance, which means less money spent on fuel. Compared to the previous model, Nokian WR SUV 3, the new Nokian WR SUV 4 has been improved especially in wet handling and braking. With substantial increase in snow braking ability, Nokian WR SUV 4 offers the best snow grip in the market. The progress made in rolling resistance makes Nokian WR SUV 4 also an economical choice. Powerful SUVs demand a lot from tyres. Tyres must be strong and firm in order to keep the tall, heavy vehicle stable even in high speeds or poor road conditions. The new Nokian WR SUV 4 actively supports the stability control systems of SUVs and manages its high wheel loads with precision and flexibility. In addition to its strong and stable structure, Aramid Sidewall technology gives the tyre even more durability. The tyre’s sidewall structure contains extremely strong aramid fibre, which makes it more resistant to impacts and cuts that could otherwise easily break it and interrupt a trip. Such damage usually requires fitting a replacement tyre. Nokian Tyres performs tyre testing worldwide, on different road surfaces and in quickly changing weather. Versatile testing ensures that the tyres work in the best possible way under varying conditions and in extreme situations. The Nokian WR SUV 4 has been thoroughly tested in testing facilities around the globe. The snow properties were fine-tuned at Nokian Tyres’ White Hell proving ground in Lapland; the slush properties were refined in Nokia’s test track in Southern Finland. The exemplary handling properties especially in high speeds are the result of rigorous testing in Germany and Spain. For added safety, the tread contains a Driving Safety Indicator (DSI) patented by Nokian Tyres. The snowflake symbol or Winter Safety Indicator (WSI) remains visible to a groove depth of four millimetres. Once the snowflake has worn out, purchasing new winter tyres in order to ensure sufficient safety is recommended. The location and pressure indicators on the information area on the tyre’s sidewall also improve safety. The information area allows for recording the correct inflation pressure and installation location when changing the tyres. Comfort and safety are improved further by an additional section that can be used to record the tightening torque of bolts. Climate Grip Concept: Supreme handling on wet, slushy and snowy roads. The directional tread pattern design brings a stable driving feel and ensures safe aquaplaning and slushplaning characteristics. The specially tailored sipes stiffen the tyre improving handling on wet and dry roads alike while the rigid SUV winter compound reliably responds to the rise and drop of the varying winter temperatures. Polished grooves. Stylish and functional: slush and water flow easily and efficiently off the slick and polished main grooves. Aramid Sidewall technology. Extreme durability. The extremely strong aramid fibres strengthen the tyre’s sidewalls providing more durability and protection for demanding driving situations. The fibre makes the tyre more resistant to impacts and cuts that could otherwise easily damage it.